Female Black-Chinned Hummingbird. Credit: Wikimedia Commons. Of all the known species of birds, the hummingbird is perhaps one of the most iconic because of its unique ability to hover. The hummingbird has a number of adaptions that allow it to fly with breathtaking agility and precision. 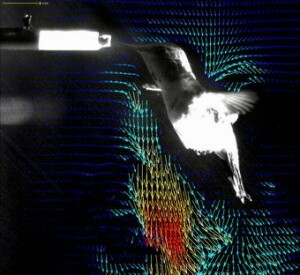 A new technique using stroboscopic laser sheets allowed scientists to see how air flows over a hummingbird’s wing, which led to some surprising discoveries. Some of the aerodynamic effects used by the hummingbird can be found on all sorts of varying aircraft. To begin, lets examine the mechanics of a hummingbird’s wing stroke. When hovering, the hummingbird has a flat figure-eight stroke lying in the horizontal plane. Unlike most birds, the hummingbird develops lift on both the downstroke and the upstroke. During the upstroke, the hummingbird is able to twist its wing backwards to attain an angle of attack suitable for generating lift because of its flexible shoulder joints. The camber of the hummingbird’s wing can also change to increase the amount of lift generated on the upstroke. Using a new technique called digital particle imaging velocimitry, scientists were able to determine that 75 percent of the lift was produced on the downstroke, and the remaining 25 percent on the upstroke. This contradicts the previous speculation that the distribution was 50-50, which is the lift distribution for most insects. The digital particle velocimitry technique uses particles of atomized olive oil that have been dispersed in the air and illuminated by a laser sheet. This allows scientists to accurately make observations about the movement of air around the hummingbird’s wings. One discovery scientists made was that hummingbirds generate lift on the upstroke with the help of leading edge vortices. Leading edge vortices are used by many insects to generate lift, so it was a surprise to discover hummingbirds taking advantage of this phenomenon. Wing-generated vortices are very important in the development of lift for animals and man-made vehicles alike. To understand leading edge vortices we first must understand the general concept of a vortex. A vortex is a type of fluid flow characterized by rotation about a theoretical axis. However, this axis does not have to be a line; it can be curved or even circular. On all wings, tip vortices form as the higher pressure on the lower surface tries to equalize with the lower pressure on the upper surface of the wing by curling over the wingtip, creating a rotational motion. Wingtip vortices of both fixed and rotating wings decrease the efficiency of the airfoil(s) by lowering lift and increasing drag. Efforts have been made to minimize these vortices by adding winglets or other wingtip devices, or by designing the aircraft to operate in close proximity to the surface in a state pilots call ground effect. In certain conditions, the tip vortices of helicopters can be amplified even to the point that the helicopter can no longer generate lift. Sea Eagle aircraft in ground effect flight over a beach. Credit: Wikimedia Commons. Leading edge vortices, on the other hand, increase lift and do not occur on all wings. As stated before, they are created by insect wings, as well as aircraft with highly swept back delta wing planforms. On insects, leading edge vortices form when the flapping motion of the wings interrupts the laminar flow of the oncoming air in such a way that influences it to rotate. This rotation provides lift to the wing in addition to the lift developed by traditional means. 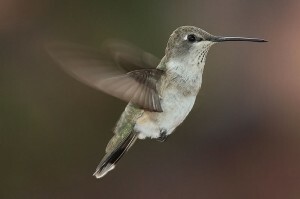 Because of the small wing size necessary to create these vortices as a result of flapping motion, only insects and hummingbirds are able to take advantage of this aerodynamic effect. Although hummingbirds have adapted an amazing ability, it comes at a cost like everything else. The aerodynamic process of hummingbird hovering is comparatively inefficient and thus requires a relatively large amount of energy, which is why hummingbirds have an extremely high metabolism rate. The slow process of evolution and adaption of all species, including hummingbirds, has shown that nature is an engineer and can solve its own problems. This only adds to the impressive abilities of the hummingbird; nature’s only living hovering avian. Hummingbird Flight an Evolutionary Marvel. The Aerodynamics of Insect Flight. NASA Innovation in Aeronautics: Select Technologies That Have Shaped Modern Aviation. Pages 11-22. Pilot’s Handbook of Aeronautical Knowledge. Pages 4-5 to 4-11. Helicopter Behavior in the Vortex-Ring Conditions. A Concept of the Vortex Lift of Sharp-Edge Delta Wings Based On a Leading-Edge-Suction Analogy. 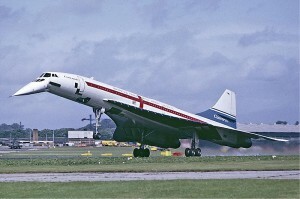 Picture of the Aerospatiale-BAC Concorde Aircraft. Black-chinned Hummingbird – Moab, Utah, USA.